Travel insurance is one big thing that everybody hates paying for. It’s that part of your journey that (hopefully) never gets used and takes a huge chunk out of your budget, meaning that you can’t do quite as much as you originally planned to do. This page offers advice on why it is necessary and what you should be looking for when you choose your policy. If you are looking to buy travel insurance immediately, you might also be interested in reading my post regarding the best travel insurance policy that is immediately available online. What Should I Look For In My Policy? What Do Travel Insurance Policies Not Cover? Does Travel Insurance Cover High Value Electrical Items Like Cameras And Laptops? Are Insurance Companies Evil People Who Want To Take All My Money? If you want to buy travel insurance, you can get a quote from World Nomads using the form below. I always use them as my personal travel insurance provider for reasons detailed below, but to summarise, I find them easy to deal with, they allow customisations and add ons, and they have never messed me around when I have needed to make a claim. Travel insurance is an insurance policy that you take out with a company in order to cover yourself for a period of time that you are away from your home country. If you have a single trip policy, it will usually expire when you return to your home country. It is also often necessary to be in your home country at the time of purchase, so that is something that you must think about before you leave on your trip (although most companies allow you to extend your policy while away if you contact them before the policy expires). If you are already outside of your own country and wish to purchase travel insurance immediately, use the quote finder from World Nomads as this offers you instant cover from anywhere in the world (which is another reason why I use them). I often travel on a tiny budget and believe that it is fully possible to travel for free… however, I would never do it purely for the fact that I would always have travel insurance. Sometimes things go wrong and if I was to get into big financial trouble by something that I did on the road (liability issues) or something that happened to me (medical bills), those bills would haunt me for a very long time and prevent me living the life that I want to live. Having travel insurance offers peace of mind in case things go wrong and it is the one thing I never travel without, as it ensures my continuing freedom in this world. Being put into a neck brace when I broke my back. I thought I should smile for a photo because it was a special occasion. Cancellations: If the cancellation is unavoidable and out of your control, you receive financial recuperation for travel, accommodation, and course expenses that you have paid for before departure. If you pay for something and then decide you don’t want to do it anymore, it will not be covered. Curtailment: Cover for travel, accommodation, and course expenses that have been paid for but not used due to you returning home earlier than planned because of accidental injury or serious illness. Curtailment expenses may also cover expenses not used due to the loss of an immediate relative or death of yourself(!). Emergency Medical Expenses: This is THE MOST IMPORTANT part of a travel insurance policy and covers emergency medical assistance and treatment (read more about this below). Loss of Passport / Travel Documents: This covers reasonable accommodation and travel costs incurred as a result of a lost or stolen passport that would have been otherwise unnecessary. Baggage and Personal Belongings: This covers damage, theft, or loss of personal belongings. Personal Liability: Coverage of legal expenses and legal liability for damages caused by you in an accidental situation during your trip. Ideally this should be hundreds of thousands of pounds, if not more, as legal expenses can be high. Financial Failure Protection: Coverage in the event that a service provider you have used goes into liquidation before you are able to use their services that you have paid for. WHAT SHOULD I BE LOOKING FOR IN MY POLICY? 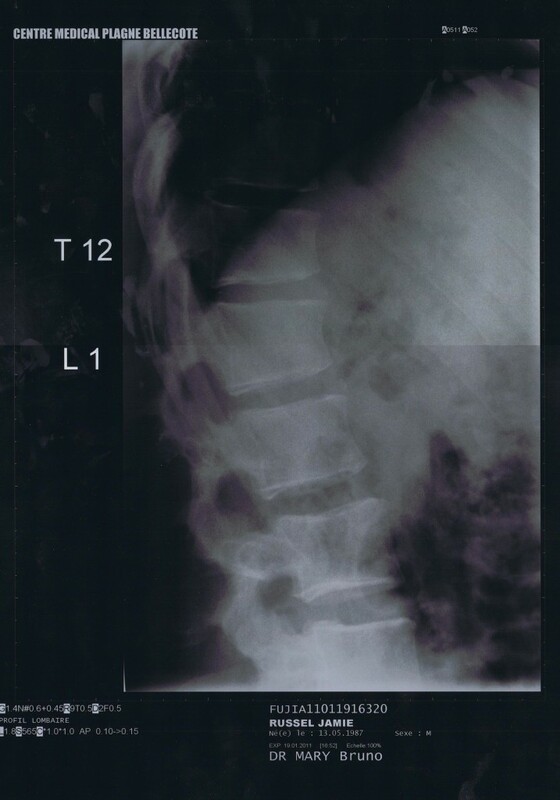 The X-Ray of my back. If you can interpret it, you will see two compression fractures of T12 and L1. If you are like me, you’ll just see a creepy looking blur. The most important part of a travel insurance policy is the medical expenses. Consider a realistic scenario of walking down a flight of stairs and tripping. You fall a long way and you suffer several broken bones, including your ribs, which then puncture your lungs. This isn’t meant to scare you, but it could happen anywhere, even where you are now. You get rushed to hospital and have to spend a week recuperating and being patched up. Your bills will be extortionate. In 2011 I spent two nights in a French hospital when I broke my back and it cost me over €1,000 a night for the use of the hospital bed, despite the fact that the only treatment that they were giving me was bed rest and a lack of food. Accidental medical expenses are the bills that you will not be able to pay on your travellers budget. Typically, insurance companies cover you for up to £1,000,000 and you should not take a policy from a company which only covers medical expenses of a few thousand pounds. It is also essential to ensure that you get a travel insurance policy that covers emergency rescue. My French accident involved transport in a sledge, a skidoo, and an ambulance that totalled charges (to my insurance company) of over €1,000. Typically you want emergency rescue cover that exceeds tens or hundreds of thousands of pounds. If you stumble of a cliff or get lost in the mountains, search and rescue helicopters aren’t cheap and you don’t want that bill coming through your letterbox. My medical bills (including rescue and physio) for my broken back exceeded 5,000 euros and I would been in big trouble if I didn’t have insurance to pay those bills for me. I wouldn’t have been able to continue living the life that I have lived over the past few years. Every policy has an excess. An excess is the amount of money that you have to pay in the instance of each claim. For example, if your policy has an excess of £150 and you make a claim of £1000, you will pay £150 whilst your insurance company pays the remaining £850. When most people think of travel insurance, they think about covering the value of their personal items. However, most insurance companies apply the excess per item. Thus if you were to lose a bag of clothing, you would have to pay the first £150 of each item (if your excess is £150). Most people do not take a lot of clothing valued at over £150 a piece, so it is unlikely that this section of the cover would be useful to most people unless they had a policy with no excess. Policies without excesses are very expensive, so pay attention to the excess of each claim in your policy wording. Generally I choose to get a policy with an excess as it is cheaper, but covers me for the big things that go wrong. If someone steals my smelly clothes, so what? If you want cover for high value items such as laptops or cameras, read on. As standard practice, adventure sports are often not covered in your policy. If you want these activities to be covered, you will often have to pay a premium (which you can do with World Nomads – another reason why I use them). Categorisation of adventure sports will vary by company and may include anything with an increased risk of injury, ranging from off piste skiing and parachuting through to hiking and volleyball. It is not difficult to find a policy that covers adventure sports; you simply have to make sure that you purchase the correct policy. High value electrical items such as cameras or laptops will normally have a maximum payout in addition to an excess. When combined, the amount that you can claim in the event of theft or loss is minimal and to counteract this, you should consider buying a policy add on if you are taking expensive equipment with you. Again, World Nomads offer this option, although I normally don’t take it. It’s a calculated risk that i won’t lose my laptop or camera, but if I did, I’d be pretty disappointed. Deliberately putting yourself in danger is normally defined by the company in question. If you are on an organised safari and get attacked by a lion, you should be covered. If you are out walking in the bush and decide to follow a group of elephants that you stumble upon, you probably aren’t covered when you end up gored against a tree. This is where dodgy companies can catch you out and I have heard many horror stories of cheap insurance providers trying to find every possible way to avoid making a payout. I once met someone whose job was finding loopholes in the policy wording so that the insurance company didn’t have to make payouts. I told him that was a pretty horrible thing to do and he agreed. As mentioned previously, you normally have to add it on as a policy extra. The standard policies don’t cover high value electrical items as these are the things that break or get stolen most often. World Nomads offer a high value electrical items policy add on. For small medical claims, you normally pay the bills yourself and keep hold of the receipts. You then send copies of these to your insurer and they should issue you with a cheque totalling the costs, less the excess. It is important to contact your insurance company as soon as possible following the medical treatment, although quite often, you have up to a year to submit the documentation. For large medical claims, your insurance company should be contacted as soon as possible to make them aware of the situation. They should then agree with the hospital to cover all medical expenses and you shouldn’t have to worry about it anymore. It is useful to have travel insurance documents to hand because certain countries may be hesitant to treat you without the assurance that they will be paid. As long as you are carrying an internationally recognised identity document (such as a passport), you should receive treatment because they have your details and know that they can chase you up. I had a problem in South Korea when I split my head open and had no documents on me. I had to walk to a friends house and collect my identity card before they would stitch me up and stop the blood flow. By this time, I had lost consciousness and my friends had to carry me back to the hospital. If you are making a claim on lost items, always report it to the police and get a police report. Insurance companies will often not pay out for theft unless claims are accompanied by an official document. If you wish to claim on anything else, always keep copies of your receipts. This is the way to prove to the insurance company how much everything costs and get the correct payout. I save all my emails when I buy or book things online and this works just fine. Around $170 (£40: £110 less £70 excess) after having my wallet lifted near Kilimanjaro. 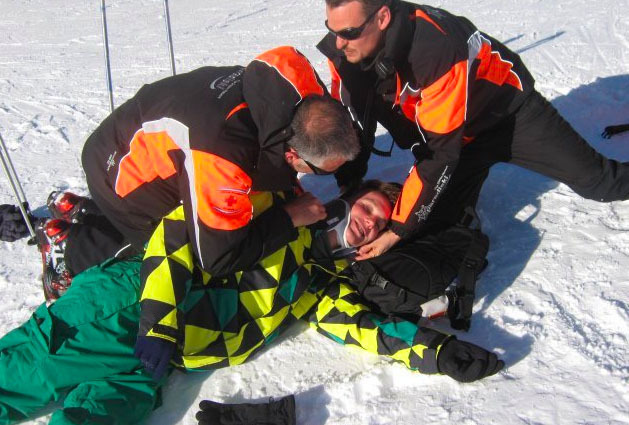 Around €6,000 (£Thousands: £5,000 less £65 excess) for rescue and ‘recovery’ after suffering a broken back in a skiing accident. Around ₩300,000 (£75: £175 less £100 excess) for stitches and injections after splitting my head open in South Korea. All things considered, travel insurance is an absolute must. If you are looking for the cheapest possible policy, you can use online comparison websites such as money supermarket (UK residents only) to find long stay cover for a small price. However, some of the policies are not that great and they may catch you out in the small print. For this reason, I refrain from recommending any of these companies. If you are looking for the budget option, please go ahead and use them. I hope (and assume) that everything will be OK. I have used budget travel insurance policies in the past without ever having to claim from them, so I do not know how easy they are to work with, but the stories my friend told me about finding loopholes in the policy wording makes me not trust them – they are cheap for a reason and we often get what we pay for in this world. From my years of travelling, I have had a lot of experience researching travel insurance policies and as a student, I often used STA Travel. I found their policies to be comprehensive, their were discounts for students, and they had an office outside my university. Since graduating, I have moved away from STA and decided that World Nomads travel insurance is the best policy to use. In brief, I found them to be slightly better value than STA (who are still a good company), they do exactly what they say they will do and watch your back when you are abroad, and their policies cover all of my needs and are fully customisable meaning that you can tailor your policy to your exact needs. This includes applying any extra add-ons such as adventure sports or high value electrical equipment. Unlike most travel insurance companies, they also allow you to purchase an insurance policy after you have left home, or to extend an existing policy if you decide to stay away longer. If you are interested in learning more, I can tell you lots more about why I use World Nomads if you care to listen. If you want an instant travel insurance quote with customisable add ons, use the World Nomads travel insurance booking widget at the top of the page to get a quote and reserve your insurance, or book it here. Disclosure: The World Nomads widget is an affiliate link which means that a percentage of the sale will be paid to Great Big Scary World. Using this widget will cost you the exact same price that you pay by going directly to their site. However, by accessing a quote from this page, you will help me to keep producing material on this site for free. I’m not going to be disappointed if you choose to take your business elsewhere, however I would appreciate it if you could tell me about any better travel insurance policies that you find as I value the integrity of the information that I share and only mention companies that I use myself.